We are a leading Manufacturer of hdpe laminated paper bags from Daman, India. The Back Seam Paper Bags are the laminated bags. These back seam paper bags are fabricated in accordance with advanced technology using graded BOPP material and are available in white and brown colors. 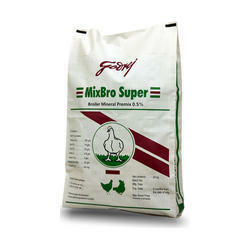 The bags are printed in 3 different colors using flexo printing option. The bags are available lengths and widths ranging from 19”, 21”, 23.5” and also made available by us in sizes required by the client. These bags are used in SMP packing, packaging of engineering plastics, saw flux, rubber, chemicals, guar gum, Psyllium husk and many more. Started manufacturing center seam bags on new Taiwan machine. Can produce White/Brown paper Laminated bags & BOPP bags. Standard width-21”,22” & 23”, length as per your requirement. In paper bags we can give 4 color printing & BOPP upto 8 colors. center seam is made from HOT melt adhesive , hence having better seam. better aesthetics compared to “L” stitch bags. Lighter weight as side stitching is eliminated.